Michael Heineman originally intended to focus his new documentary on one of the many vigilante and militia groups that have taken it upon themselves to patrol the border between the United States and Mexico in an attempt to stop the flow of undocumented immigrants and drugs. His protagonist would be Tim “Nailer” Foley, founder of the Arizona Border Recon, a war veteran who, after losing his job at the height of the 2008 economic debacle, decided to sell all his belongings, don his military gear once again and protect his country. But then something interesting happened as Heineman began following Foley and his men on their nightly patrols: he also read about the Autodefensas that had sprung up in Michoacán, about 1,030 miles south of the border, and their fight against the deadly Knights Templar Cartel led by Servando “La Tuta” Gómez. And he thought, why not tell this story about vigilantism from both sides of the border? The result is “Cartel Land,” a harrowing, shocking and troubling dispatch from one of the many fronts in the war against drugs. 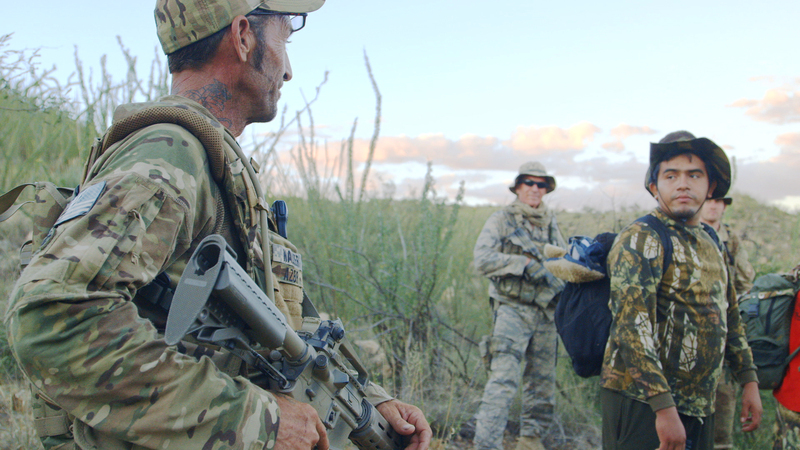 “Cartel Land” is bookended by night time scenes shot in the Mexican desert: a group of armed, masked men deliver and unload from a truck the raw materials used in the manufacturing of methamphetamine. Another group of masked men stand around a gigantic cauldron cooking up the materials, the billowing white smoke coming out of the cauldrons silhouetting them against the headlights and night sky. In interviews, they all point their fingers to the North and to Mexico’s frail economic landscape: the drug industry is their only way out of poverty and since there is a high demand for drugs up North, why not satisfy it? Supply and demand at its finest. These scenes provide context to the story of these two vigilante groups and its leaders… so does the burial of 13 members of one family executed by the Knights Templar because their employer could not pay the Cartel’s “protection fee.” Controlling her tears until the very end, the family’s sole surviving member addresses the camera directly as she recounts the tragedy, including the death of a baby at the hands of the Cartel. Acts such as this and the beheading of three friends (a photo of which he matter-of-factly shows the camera), drove Dr. Jose Manuel Mireles to establish the Autodefensas de Michoacán in 2013. In the eyes of Mireles and his men, if the government and the military are not willing to take action, if, in fact, they are part of the problem by being in cahoots with the cartels, then the community has the responsibility to take up arms and fill the void left by the powers that be. Better to die with your boots on than beheaded for no good reason. The Autodefensas efficiently and ruthlessly kick the Knights Templar out of every single town in Michoacán, even though Heineman avoids asking or showing what they actually did to them. Embedded with the Autodefensas, Heineman and his team capture the good, the bad and the ugly. They find themselves in the middle of shootouts, witnessing potential and actual acts of torture and abuse, and a tense encounter with the military as they, unsuccessfully, try to disarm the Autodefensas in a public square. Heineman also records how they eventually lose the communities’ support, how they seem to fill the void left behind by the Knights Templar and how they are eventually absorbed by the government. Mireles is neither hero nor villain, just a flawed individual driven by the best of intentions. After suffering severe injuries in a plane crash –in what appears to be an assassination attempt– he appoints his right hand man, Estanislao Beltrán “Papa Smurf,” as the Autodefensas’ commander in his absence. A quiet, unassuming man, Beltrán is the kind of person who bides his time, waiting for the right opportunity to take over the Autodefensas and turn it into his own little corrupt empire. The scenes north of the border pale in comparison to the events taking place a thousand miles away. Yes, Foley and his men round up and turn over to the border patrol the occasional handful of undocumented immigrants. But their nights are spent walking up and down desert hills and paths with nothing to show in return. Once in a blue moon they’ll see, in the distance, a couple of men who they suspect may be working for a cartel. But as soon as they see them, the men are gone. And yet, by comparing and contrasting both Mireles’ and Foley’s efforts, Heineman creates a dichotomy between perception and reality. Foley may believe that our borders are porous and that the U.S. government is not doing enough to protect them. And his intentions may be as noble as Mireles’, but they are equally misguided. But Foley and his ragtag team of Fox News-consuming volunteers seem to ignore that, as far as the cartels’ presence in the United States is concerned, the real action is happening in cities such as Chicago where they have already established a base of operations. And while Foley expresses a certain degree of admiration for what Mireles and his men are doing (and frustration that he can’t do the same), his paranoid -and yes, racist- perceptions of a country under siege in no way matches the crude, cruel sights of whole families massacred, bodies hung from bridges, and mutilated bodies left in the middle of the roads or buried in shallow graves. There is no question that the scenes in Michoacán, with their “you are there” immediacy, are far more thrilling, more interesting, than anything happening in the desert. There is no doubt that there is more at stake for Mireles and his men than for Foley. 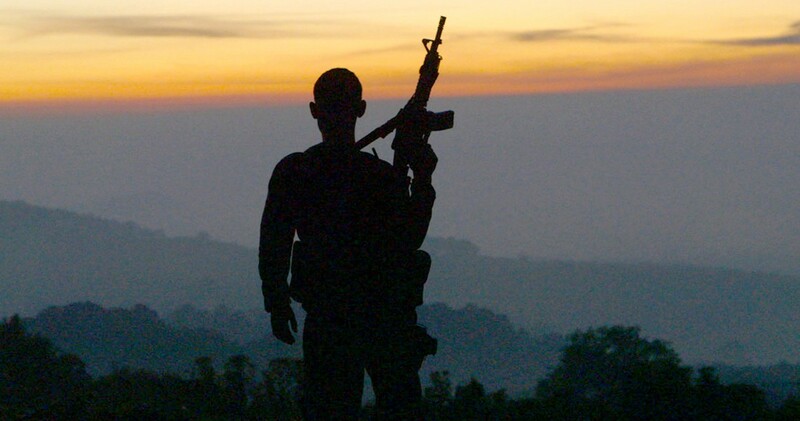 For the latter, “Cartel Land” is a state of mind. For Mireles and Mexico, it’s a harsh world they have to live in, 24-7.